2007-08-17 Application filed by Google Inc. filed Critical Google Inc.
 Social network objects of various object types can be ranked, each according to its type. The objects may comprise types such as users, communities, blogs, blog entries, events, forums, forum topics, postings, photographs, images, and/or albums. According to one method, ranking data about the social network objects are stored. The ranking data comprises data about events performed on the social network. For each social network object, a ranking function is applied to ranking data about the social network object based on its type. In addition, the recency of an event on the social network related to the social network object is evaluated, in order to calculate the score for the social network object. A relative ranking for each of the plurality of social network objects based on its score is determined, and the score and relative ranking of each of the social network objects stored. In an embodiment, a query for social network object is received. The generated search result comprises social network objects of different object types. Code for, when executed, displaying the search result ordered by the relative rankings of the social network objects is generated. Alternatively, social network objects with a score above a predetermined threshold are identified. Code for, when executed, displaying the identified social network objects in a visually distinguishable way on a webpage of the social network is generated. FIG. 3 is a high-level block diagram of elements on a social network server. FIG. 4 is a flow chart illustrating a process for scoring social network objects. FIG. 1 is a block diagram of an online social networking system in accordance with one embodiment of the present invention. The social networking system 100 communicates with multiple client devices 102 over a network 106. Each of the client devices 102 includes a browser 1 10 or comparable application for providing and accessing content managed by the social networking system 100. (In FIG. 1 and the remaining figures, a letter after a reference numeral, such as " 102a," is a reference specifically to the element having that particular reference numeral. A reference numeral in the text without a following letter, such as " 102," is a general reference to any or all instances of the element bearing that reference numeral; e.g. " 102" refers to reference numerals " 102a," " 102b," and/or " 102n" in the figures.) The social networking system 100 includes a social network server 200 and an internet server 150. The social network server 200 includes a community server 300 and ranking module 330, and is coupled to a social network database 130. These elements are used by the social network server 200 to provide social network services and content to clients 102 and facilitate social networking interactions between them. The social network server 200 enables users of devices such as clients 102, to interact with other users in an online social network. The various servers in the social networking system 100 may comprise a dedicated server- class computer system comprising applications, one or more processors, memory, storage, and associated software applications. The servers may also individually comprise multiple computers operating under a load balancing scheme, or other mechanisms for distributing processes and data. The social networking system 100 supports an online social network comprising a set of entities who are members of the social network, and who communicate with each other via the services and facilities of the system 100. A member of an online social network can be any entity such as, for example, a person, an organization, a business, a corporation, a community, or other suitable entity. These entities can have various types of social relationships, such as community membership, professional or social organizations, friendships, or simply groups with common interests. Each member is represented by a stored profile that comprises one or more entries containing information about the member. A member may be represented by a person profile, business profile, organizational profile, or a profile belonging to any other class of profile. Each member has an identifier that can be used to identify the member within the network (e.g., a user name). Each profile type is associated with different types of entries. For instance, a person profile can include entries comprising contact, personal, and professional information, while a business profile may include entries describing industry information or financial information. Other entry types can store social, demographic, networking, or other types of information. Personal profile entries may comprise contact information such as email addresses, mailing addresses, IM name, or phone number, personal information such as relationship status, birth date, age, children, ethnicity, religion, political view, sense of humor, sexual orientation, fashion preferences, smoking habits, drinking habits, pets, hometown location, passions, sports, activities, favorite books, music, TV, or movie preferences, or favorite cuisines, professional information such as skills, career, or job description; photographs of a person or other graphics associated with an entity, or any other information describing, identifying, or otherwise associated with a profile. Entries for a business profile can comprise industry information such as market sector, customer base, location, or supplier information, financial information such as net profits, net worth, number of employees, stock performance, or other types of information associated with the business profile. Each member' s profile includes information that associates the member with the profiles of other members in the social network. An association between members has a type. Types of associations include, for example, friendships, romantic relationships, business relationships, acquaintances, community associations, activity partner associations, common interest associations, common characteristic associations, or any other suitable type of association between profiles. For example, a user may designate himself as a "fan" or a "friend" of another user. A given type of association can have multiple levels to indicate the degree of the association. For example friendship levels can include, for example, a "haven't met" level, an "acquaintance" level, a "friend" level, a "good friend" level, a "best friend" level, or other suitable levels. Similar levels for other types of associations are readily determined by those of skill in the art. The ranking module 330 evaluates and ranks various online social network objects returned in response to a query and is described in greater detail with reference to FIG. 3. As users take actions within a social network, such as registering in a network, designating another member as a friend or fan, joining a community within the network, viewing webpages, annotating profiles, and posting content, these events are indexed. The indexed information includes the type of object being created, manipulated, or accessed, the type of event, and the associated details, such as a timestamp, user, and so forth. This event data can then be used as the basis of object rankings. The ranking module 330 accesses this ranking data and processes it to determine scores and rankings for social network objects. The particular ranking function applied to each object and the ranking data to which the ranking function is applied depends on the object' s type. The ranking functions can be based on either direct, derived, or aggregated values. The ranking functions preferably rank objects as an indicator of their popularity, as computed by various metrics, as further described below. For instance, a member can be ranked according to the number of his or her fans and friends, while a community forum can be evaluated based on the number and recency of posts in the forum, the number of members, the rate at which posts are being made or the rate of member sign up, and so forth. Various ranking functions are described in greater detail with reference to FIG. 4. On a periodic basis, the rankings are refreshed and saved into an index. As described with reference to FIG. 4, the indexed ranking data is used to order search results, select objects for presentation, and/or designate certain social network objects as popular. The social network server 200 also comprises a community server 300 for carrying out various aspects of online community management such as creating and operating communities. Communities are named and preferably have descriptions that specify the types of topics, events, and members of the community. Communities may also have keywords and/or labels that indicate the types of topics and subject categories that are off interest to the members of the community, and which can be used to classify the community and its members. Posting within a community may be moderated by a member or online community provider comprising a community "owner" or may be unmoderated. Community membership may be restricted in some manner or may be open to the public at large. Communities may be placed into various categories and subcategories of organization. Community subcategories can comprise groups of profiles within a larger category that share common interests or characteristics independent from the entire community. For example, a general "basketball players" community category can comprise communities of basketball players for any location or type of basketball. A sub-community category within the basketball community category could comprise communities of basketball players belonging to a certain geography. Thus, a "California basketball players" sub community category could comprise communities including "LA basketball player," "Oakland basketball player," and "Santa Clara basketball player" communities. The general "basketball community" can also be placed into a larger overall "basketball" community that includes "basketball player" communities as well as "basketball watcher" communities. FIG. 2 depicts an example of webpage of an online community of a social network, as provided by the social networking system 100. A wide variety of services and features are provided for members of the online community "Beijing 2008 Olympics." A description of the community, "A community for travelers to and fans of the Beijing Olympics" is provided on the page, as well as an image 250 that represents the community. The name, description, and image of the community 205 can be provided by the community creator or author of the community, or may be supplied by a community content module as described below. The community server 300 of FIG. 1 supports the various services described and/or shown. As shown, the status of certain members is depicted as online and offline, depending on whether or not the members are logged in to the community or the online social network that the community belongs to. The community webpage includes a search interface 210 for receiving queries from members seeking content on the online social network. This content can comprise various social network objects such as members, discussion forums 220, events, photo albums, blogs, documents, files, and communities. Such objects can be ranked in accordance with any of a variety of ranking popularity functions, including those described with reference to FIG. 4. Objects with high popularity rankings may be annotated, for instance with a star, or placed into a particular portion of a community webpage such as a "hot pick" or "most popular" section. The community webpage includes several forums 220 for discussion of various topics, such as "volunteer opportunities," and "fencing fans sought." The forums include messages in a discussion thread. Messages can be modified and deleted after their creation by the creator or by an administrator of the community. In an embodiment, messages on the same topic can be browsed from the oldest to the most recent. In addition, a topic can contain an unlimited number of messages. Users can create topics for discussions. In an embodiment, the topic comprises the subject of a first message in a discussion thread. Topics can be modified and deleted after their creation by the creator or by an administrator of the community. Several most recent topics are displayed on the community pages. Communities may allow for "open" posting by members outside of the community. Or they may restrict posts to community members, as specified by the community creator or administrator. The community webpage also includes an event calendar 230 for storing information about events. Events are short messages describing an event (location, date, etc). In an embodiment, any user can create, modify, and delete their own events as well as post community events. Several most recent events may be displayed on the event calendar 230. The event calendar can be supplemented with geographic information including the location of the event. In an embodiment, a map display of an event location is included in or linked to from the community page. Users can choose to participate in events, and participants in an event may be made visible to other members of the community. A number of different types of links may be supported in an online social network among users and communities. As shown in FIG. 2, a community can be linked to one or more related communities 240. This helps users find communities of interest. In an embodiment, such related communities are automatically identified by checking what communities have the most members in common, relative to their size. Communities can also be considered "related" if there is a significant degree of overlap between forum topics, titles, keywords, or other community aspects. FIG. 3 is a high-level block diagram of selected elements on a social network server in accordance with one embodiment of the present invention. The elements comprise a search engine 305, suggestion processor 310, community creation module 320, ranking module 330, and community content module 340. As used herein, the term "module" refers to logic for providing the specified functionality. A module can be implemented in hardware, firmware, and/or software. Preferably, a module is stored on the storage component of an electronic device, loaded into its memory, and executed by the device processor. The community creation module 320 and community suggestion processor 310 facilitate the creation of communities within an online social network. The community content module 340 routes and distributes content within an online social network. The search engine 305 receives and processes search requests and generates search results that include objects on the social network as well as on the Internet generally. It includes the ranking module 330, which evaluates and ranks various objects within a social network. The community creation module 320 comprises a module for creating online communities. The community creation module 320 enables the dynamic creation of online communities according to specific scenarios. In one scenario, a member types in a search query in order to locate a community of her interests, using for instance a search interface within an online social network. The search engine 305 processes the search query and looks for matches, for instance an exact match to the search query and/or matches to one or more of the search terms. When there are no matches, according to whatever search approach is used by the search engine 305, the community creation module 320 prompts the user to create a new public community with a name supplied by the user. The name is unique among public communities. In another scenario, the community creation module 320 dynamically creates a public named community when a user attempts to specify a community that does not exist. In such a scenario, a user attempts to apply a label to a social network object such as an event, posting, forum, or blog entry. The search engine searches for any communities that have names that match one or more terms in the label name. If there are no communities that match the label name, the community creation module 320 dynamically creates a community with the label name. Under both of these scenarios, a community is automatically created for the user, bypassing the conventional community creation process. In an embodiment, the resulting community under either of these scenarios is a public community whose ownership belongs to the public. This means that the community is administered by social network administrators rather than the creator or her designees. Once a community has been created, the community creation module 320 may prompt the user to optionally enter some description, labels, and/or keywords and provide images for the community. The community creation module 320 preferably performs additional steps to automate the population and management of newly created communities. For instance, the community creation module 320 may apply default settings to the community that membership is open to the public, rather than restricted. The new community includes the user as a member. In addition, the community creation module 320 may implement several controls or policies on the new community that encourages members to join the community by reducing the risk of spam and off-content posting. Such controls may include disallowing the sending of messages to all community members, and disabling anonymous posting by social network users. These controls may be publicized in a community information or profile page. They may be encoded by a social network server into the presentation of community webpages (e.g. with or without a "send to all members" option displayed). Furthermore, a community rules engine may implement controls such that, when a user attempts a prohibited action, they are prevented from doing so. The community creation module 320 may also automatically search for relevant web content such as news, images, and advertising posted on the internet and place such content in a newly created forum or an existing forum. Similar searches for related or relevant communities, members, blogs, and other online social network content can be performed. The searches may be performed based on the community name, or any other content description, keyword, images, or content provided by the user. This information may be used in combination with the user' s profile information such as the user' s membership in related communities, friends, or fans. For instance, communities that have overlapping keywords with a newly created community may be identified as appropriate for receiving a solicitation to join the new community. A social network server generates code that, when executed, displays a link to the new community to these identified pre-existing communities. Other users within the online social network to whom the new community can be advertised may be identified in a similar way. Users are identified that have provided keywords, labels, postings, or other content to the social network that match the new community's name, keyword, or other description using standard Boolean, relevance, or other matching techniques. Links to the new online community can also be provided to these users. A suggestion processor 310 may be provided to improve the community creation process carried out by the community creation module 320. The suggestion processor 310 comprises a server and software for providing search results to unmatched search queries using any of a variety of techniques. For instance, in an embodiment, the suggestion processor 310 uses known language processing techniques to identify spelling, grammatical, or other obvious errors in a user query. The suggestion processor 310 devises one or more suggested search terms, based on a dictionary, a directory of existing community names, or the most common spelling of each word in the query, based on queries of other users. The terms may be supplied back to the user, who can be prompted to re-initiate a search based on the revised terms. In another embodiment, the suggestion processor 310 may use other language processing techniques that rely, for instance, on known associations/substitutions of words (as may be provided by a thesaurus or slang dictionary, for instance) to search existing communities and suggest them to a user based on their query. The search may be performed based on the names as well as keywords of existing communities. For example, a user may enter a query like "China Olympic," or "Peking 2008." Although there may not be a specific match for either of these community names, the suggestion processor 3 10, based on information about existing communities or the most common spellings of words based on queries of other users, may suggest the community "Beijing Olympics 2008" to the user. By providing such suggestions, the risk of creating of multiple communities with different names that all are meant to refer to the same thing is minimized. The community content module 340 comprises code for distributing content within a social network. Users provide content to the online social network such as forums, forum posts, events, blog entries, documents, files, videos, and images. The community content module 340 takes the content and makes it available to other users. In an embodiment, the content module 340 supports multi-community content sharing. When a user creates an object such as a forum within the context of a single community, the user may indicate by direct designation what other communities the forum topic should also be cross- posted to. In an embodiment, the user does not need to directly designate communities for cross-listing of the object contributed by the user. Instead, the user can associate labels with the object. Based on the label, a matching module (not shown) can find relevant communities to which to also cross-post the user's contribution. The community content module 340 receives this information and uses it to provide the object to multiple different communities. Responses to the object, such as follow up posts, entries, or comments provided by other users may also be provided by the community content module 340 within the different communities in which the object is posted. Alternatively, the responses may also be provided in a single webpage accessible to the multiple communities devised by the community content module 340. The ranking module 330 comprises a processor for ranking various social network objects such as users, communities, forums, blogs, blog postings, and photo albums. The ranking module 330 collects data with which the social network objects can be scored and ranked. Object rank can be generated based on extrinsic factors, such as the popularity of the object to users as measured, for example, based on quantity, velocity, or recency of access or responses received, or other intrinsic factors such as the status of the poster of the object. Ranking data such as community traffic may be stored in a social network database. The engine 330 periodically evaluates objects within the social network using the ranking data in order to determine a score or rank for each of the objects. As illustrated in FIG. 4, a ranking module collects or receives 410 ranking data about social network objects to be ranked, for instance, stored in a social network database. The ranking data comprises information about events on a social network, such as member visits to web pages, social network postings, replies in a forum, user registrations, changes to a user profile, changes to membership in a community, or other indicia of activity within an online social network. 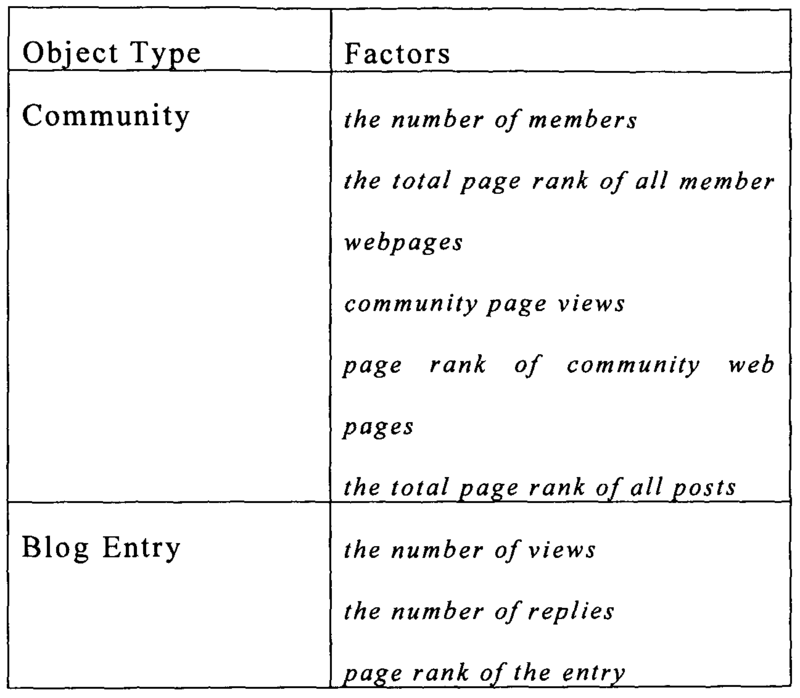 Each type of collected ranking data corresponds to at least one type of social network object. 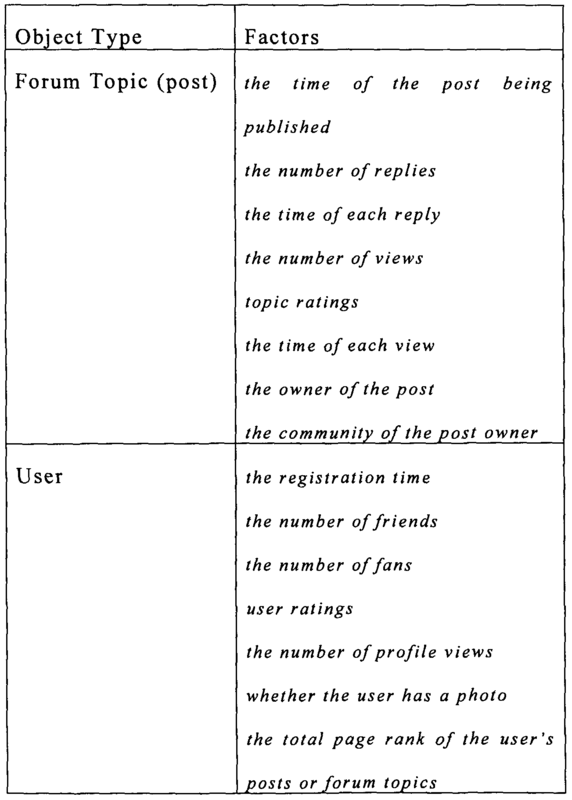 For instance, as described in more detail below, ranking data for a forum topic comprises data about posts on the topic, while ranking data for communities in the social network comprises data about members in the communities, and ranking data about users comprises data about registration times of the users on the network. Also as described below, specific ranking functions particular to each object type are applied to the ranking data. The ranking data also comprises externally generated ratings of social network objects such as the page rank of social network web pages based on hyperlinks to the web pages. Methods for calculating a page rank are described in U.S. Patent No. 6,285,999, titled "Method for Node Ranking in a Linked Database" and/or U.S. Patent No. 6,799, 176, titled "Method for Scoring Documents in a Linked Database" and/or U.S. Patent Application No. 20050071741 , titled "Information Retrieval Based on Historical Data," each of which are hereby incorporated by reference herein. Page rank or other external ranking data may be retrieved from an internet or other server external or coupled to a social network server as shown in FIG. 1. The retrieved ranking data is then stored. K) is the number of other members whom the user has designated and/or which have designated the user a "friend" (i.e. reciprocal friend designation), K2 is the number of other members whom the user has designated and/or which have designated the user a "fan" (i.e., reciprocal fan designation), K3 is the number of profile views, Si is the pagerank of one post, and K4 is the number of posts owned by the user. In addition, another indicator of user importance is whether or not the user has a photo. The ranking score is positively scaled (e.g. 2x) for users with photos. K is the total number of posts in the community. In addition, a community is ranked according to its members, including their number, rankings, or other factors. The rank of the community is cumulative of user rankings, each of which can be weighted by how long the user has been a member of the community (i.e., length of time since the user joined the community). Other ranking functions, factors, and weightings are also used. "Boosts" increase the value of an event based on the recentness of the last posting or reply event within a forum, blog, or community for instance. Additional scale factors can be used to further adjust the individual weightings. First, if an event has occurred within a predetermined time period from the present, its value is upscaled, i.e., multiplied by a value greater than one. Down scaling can be applied as well, if the number of events falls below a certain threshold. For example, if the number of replies in a forum is less than 5, then the weighted sum is multiplied by a value less than one. Recency may be accounted for using other techniques such as the total number of page views over a fixed time segment, etc. Once scores have been calculated 420 for a group of objects, a relative ranking of the objects can be determined 430. The objects are sorted by scores, and the ranking of each object is its ordinal position in the sorted list. The rankings may then be used 440 in one of a variety of possible ways. For instance, the scores may be used 440 to rank objects relative to each other in the presentation of search query results. In addition, code for displaying objects with a score above a certain threshold may be generated that visually distinguishes or annotates the objects, using distinguishing fonts, colors, or graphics (e.g., a "star" icon) for instance, or be presented in the form of a "recommendation." The ranking can also be used 440 to determine what objects to place in a category such as "hot communities," "featured post," or on an electronic billboard. Objects that receive a top-ranking, that is, that are ranked above a certain rank, may be designated for inclusion in such categories. The top-ranked objects are thus designated as such to users. One or more of the steps shown in FIG. 4 may be performed by elements on the client or server side. In addition, the steps and instructions of described could be embodied in software, firmware or hardware, and when embodied in software, could be downloaded to reside on and be operated from different platforms used by real time network operating systems. Not every possible step is shown in the figures. In addition, some embodiments perform different steps in addition to, or instead of, the ones described herein. Furthermore, the order of the steps can vary from that described herein. In other embodiments, some or all of the steps are performed by entities other than those described. Embodiments of the invention also include computer program products for performing various operations disclosed herein. The computer program products comprises program code that may be embodied on a computer-readable or accessible storage medium, such as, but not limited to, any type of disk including floppy disks, optical disks, CD-ROMs, magnetic-optical disks, readonly memories (ROMs), random access memories (RAMs), EPROMs, EEPROMs, magnetic or optical cards, application specific integrated circuits (ASICs), or any type of media suitable for storing electronic instructions. One or more parts of the program code may be distributed as part of an appliance, downloaded, and/or otherwise provided to a customer. 1. A computer-implemented method for ranking a plurality of social network objects, each object belonging to one of a plurality of different social network object types, the method comprising: storing ranking data about the plurality of social network objects, the ranking data comprising data about events performed on the social network; for each of the plurality of social network objects, scoring the social network object by applying a ranking function to the ranking data of the social network object based on the social network object's type, wherein the ranking function is based at least in part on the recency of an event on the social network related to the social network object; determining a relative ranking for each of the plurality of social network objects based on the respective social network object's score; and storing the score and relative ranking of each of the social network objects. 2. The method of claim 1, wherein the social network objects comprise forum topics, and the ranking data comprise data about posts on the topics. 3. The method of claim 1, wherein the social network objects comprise communities of the social network, and the ranking data comprise data about members in the communities. 4. The method of claim 1, wherein the social network objects comprise users, and the ranking data comprise the number of posts owned by the user. 5. The method of claim 1, wherein the ranking function is based at least in part on the recency of an event by applying an exponential time decay function to ranking data in order to calculate the score for the social network object. 6. The method of claim 1, wherein the ranking function applies a scale factor greater than one based on the event on the social network related to the social network object occurring within a predetermined time period from when the ranking function is applied. 7. The method of claim 1 , further comprising: receiving a query for social network objects; generating a search result to the query comprising social network objects of different object types; and generating code for, when executed, displaying the search result ordered by the relative rankings of the social network objects. 8. The method of claim 1, further comprising: identifying social network objects with a score above a predetermined threshold; and generating code for, when executed, displaying the identified social network objects in a visually distinguishable way on a webpage associated with the social network. 9. The method of claim 1, further comprising: determining, based on their relative ranking, top-ranked social network objects; and generating code for, when executed, displaying the top-ranked social network objects to users of the social network in a visually distinguishable way on a webpage associated with the social network. 10. The method of claim 1 , wherein the ranking data comprise rankings for webpages associated with a social network object of the plurality of social network objects. 11. A computer program product for ranking a plurality of social network objects, each object belonging to one of a plurality of different social network object types, comprising code encoded on a computer-readable medium for performing the steps of: receiving ranking data about the plurality of social network objects, the ranking data comprising data about events performed on the social network; for each of the plurality of social network objects, scoring the social network object by applying a ranking function to the ranking data of the social network object based on the social network object's type, wherein the ranking function is based at least in part on the recency of an event on the social network related to the social network object; determining a relative ranking for each of the plurality of social network objects based on the respective social network object's score; and determining a relative ranking for each of the plurality of social network objects based on its score; and storing the score and relative ranking of each of the social network objects. 12. The computer program product of claim 11, wherein the social network objects comprise forum topics, and the ranking data comprise data about the time of replies to the topic. 13. The computer program product of claim 11, wherein the social network objects comprise communities of the social network, and the ranking data comprise page rank data about web pages of the communities. 14. The computer program product of claim 11, wherein the social network objects comprise a user, and the ranking data comprise the user's time of registration on the social network. 15. The computer program product of claim 11, wherein the ranking function is based at least in part on the recency of an event by applying an exponential time decay function to ranking data in order to calculate the score for the social network object. 16. The computer program product of claim 11 , wherein the ranking function applies a scale factor greater than one based on the event on the social network related to the social network object occurring within a predetermined time period from when the ranking function is applied. 17. The computer program product of claim 11, wherein the steps further comprise: receiving a query for social network objects; generating a search result to the query comprising social network objects of different object types; and generating code for, when executed, displaying the search result ordered by the relative rankings of the social network objects. 18. The computer program product of claim 11 , wherein the steps further comprise: identifying social network objects with a score above a predetermined threshold; and generating code for, when executed, displaying the identified social network objects in a visually distinguishable way on a webpage associated with the social network. 19. The computer program product of claim 11 , wherein the steps further comprise: determining, based on their relative ranking, top-ranked social network objects; and generating code for, when executed, displaying the top-ranked social network objects to users of the social network in a visually distinguishable way on a webpage associated with the social network. 20. The computer program product of claim 11, wherein the ranking data comprise rankings for webpages associated with a social network object of the plurality of social network objects.